How fierce is the rivalry between the Carringtons and Colbys during the first season of the Dynasty TV show on The CW? As we all know, the Nielsen ratings typically play a big role in determining whether a TV show like Dynasty is cancelled or renewed for season two. Unfortunately, most of us do not live in Nielsen households. Because many viewers feel frustration when their viewing habits and opinions aren’t considered, we’d like to offer you the chance to rate all the Dynasty season one episodes here. A CW reboot of the classic 1980s primetime soap, Dynasty stars Grant Show, Alan Dale, Elizabeth Gillies, Nathalie Kelley, James Mackay, Sam Adegoke, Robert Christopher Riley, Rafael de la Fuente, Brianna Brown, and Nick Wechsler. The drama centers on the wealthy Carrington family and the energy empire they must defend against the Colbys, as well as other adversaries. Although Fallon (Gillies) is the heir apparent to father Blake’s (Show) company, she grows suspicious when she learns he is marrying the beautiful, much younger Cristal (Kelley). When Fallon sets out to expose the interloper as a fraud, her actions cost her her father’s trust, so she forges an alliance with his rival, Jeff Colby (Adegoke). Blood is thicker than water, but whether it’s dearer than oil remains to be seen. What do you think? Which season one episodes of the Dynasty TV series do you rate as prosperous, impoverished, or somewhere between? 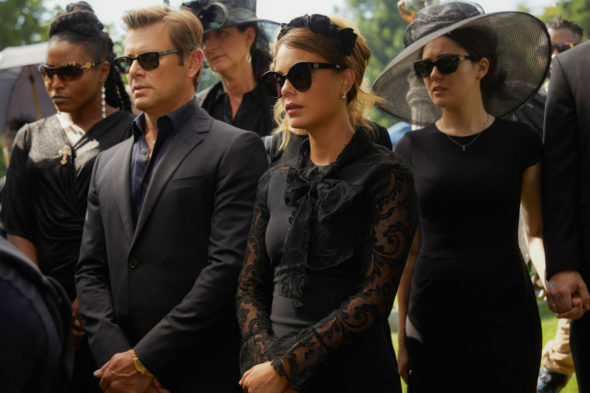 Should The CW cancel or renew Dynasty for a second season? Don’t forget to vote, and share your thoughts, below. Why are you getting rid of all the good Sci-Fi good shows and sticking us with stupid Reality TV/Game Shows/Housewives/The Idol/The Voice type shows>???? I would rather watch something I know can never happen to me and lose myself in a good story. I think it’s because the Reality stars don’t get paid as much as real actors/actresses get paid or you are just plain dumb when it comes to what we love to watch! Doesn’t begin to measure up with the old Dynasty show. I stopped watching it after the second show. In love with Dynasty its so unpredictable and that makes it more interesting. Me either lol. Do you know when Season 2 starts?